$5,000 to $10,000 REBATES. We Crush RV Show Prices! Save on all-new Keystone Mountaineer RVs! If you're a fan of the Keystone Montana, then just wait till you see how the Mountaineer RV takes this popular recreational vehicle to all-new levels of comfort, style, and performance. Enjoy convenient amenities, creative floor plans, spacious interiors, contemporary style and more - plus all the standard features and benefits that have long made the Keystone Montana one of the most popular fifth wheels in North America. Best of all, with Lakeshore RV, you can rest assured you're not only getting the lowest price for your new RV - but also dedicated customer service and support you can count on. That's why we're #1 in Keystone Mountaineer sales worldwide. 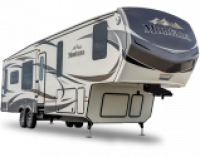 Click through to our site today to learn more about the Keystone Mountaineer RV, or call us at 855-700-1665.